San Francisco: Apple Inc stunned Wall Street by reporting results that missed expectations for the first time in years, blaming rumors of the new iPhone for hurting demand in the September quarter. It was Apple’s first quarterly earnings under chief executive Tim Cook, who took over from Steve Jobs in August at a critical juncture for the company. Apple is battling Google Inc in the mobile arena, as well as other challengers such as Samsung and Amazon.com Inc.
“Investors are going to start to speculate that there is change under way now that Jobs is gone, and that there’s trouble ahead. 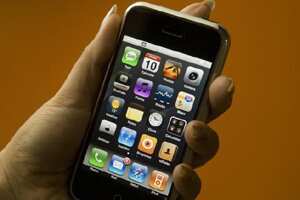 We don’t share that point," said Channing Smith, co-manager at Capital Advisors Growth Fund, which holds Apple shares. “The iPhone is where the weakness was and it’s an explainable one. The strong demand for the iPhone 4S set up strong demand for the holiday season." Apple said it sold 17.07 million iPhones in its fiscal fourth quarter ended 24 September -- well short of the roughly 20 million forecast by analysts. The iPhone is Apple’s flagship product, yielding some 40% of annual sales. Revenue rose 39% to $28.27 billion, lower than the average analyst estimate of $29.69 billion, according to Thomson Reuters I/B/E/S. It was the first time Apple missed revenue expectations since the fiscal fourth quarter of 2008. Net profit was $6.62 billion, or $7.05 a share. That fell shy of expectations for earnings of $7.39 per share. The last time Apple missed EPS estimates was in the first quarter of 2001, according to Thomson Reuters I/B/E/S. “Expectations for this company were red-hot, that is why we downgraded it," said BGC Partners analyst Colin Gillis, who lowered his rating on the shares days before. “The reality is their business is not an annuity. They have to sell their quarter’s worth of revenue every 90 days." “They had a big upgrade cycle with the iPhone, the numbers came in weak. They need to set records every time they report to keep up the momentum." Apple executives said consumers had postponed purchase decisions until the crucial holiday quarter because of speculation that a new phone was on the way. Apple unveiled the iPhone 4S in early October, and it hit stores last Friday. Apple -- which typically offers projections so conservative they are disregarded -- on Tuesday forecast December quarter revenue and earnings above Wall Street’s estimates. “There’s no question this was a transition quarter ahead of the 4S," said WP Stewart portfolio manager Michael Walker. “With the early pace of iPhone 4S sales, my guess is that disappointment is relatively short-lived." “I’m not going to call Q3 a throwaway quarter for iPhones, but it was definitely a transition." Cook started his first earnings conference call as CEO by honouring Jobs, who died on 5 October after a years-long battle against pancreatic cancer. He said he was “very confident" of posting record iPhone sales in the current quarter. The company moved 4 million iPhone 4S units -- more than double its predecessor -- in its first three days, despite lukewarm reviews. Another area for optimism for Apple was iPads. The company moved 11.12 million units during the quarter despite attempts by various manufacturers, including Samsung, to capture a slice of the tablet market. Now Amazon.com has also entered the fray with its Kindle Fire tablet. Acknowledging the competition, Cook said it was “reasonable to say" none of Apple’s rivals have gained any traction, and he expected the tablet market to be bigger than personal computer in the long term. Cook also told analysts that Greater China -- mainland China, Hong Kong and Taiwan -- was becoming an all-important region for Apple as it has “quickly become No. 2 on our list of top revenue countries very, very quickly." Revenue from the region increased four-fold to $4.5 billion during the quarter. The new CEO fielded questions on Apple’s cash pile of over $81 billion, saying the money provided flexibility for acquisitions and investing in the supply chain. “That said, I’m not religious about holding cash or not holding it," he added. “It’s a topic for the board on an ongoing basis." Apple’s Mac sales saw a large spike during the September quarter but it failed to lift earnings. Apple sold 4.89 million Macs, up 27% from a year ago. Gross margin came to 40.3% -- a tad higher than Wall Street’s forecast of 39.74%. International sales accounted for 63% of the quarter’s revenue. “We expected iPhone sales to decline in the September quarter from the June quarter as a result of the announcements we made ... in June, where we said we would launch iOS 5 and iCloud in fall," Peter Oppenheimer, chief financial officer, said in an interview with Reuters. “That basically created the rumour of the day across the September quarter, especially at the end." Apple said it expected December quarter earnings of $9.30 a share on revenue of about $37 billion. Wall Street is projecting $9.01 for the period, but it was unclear if that was comparable. “What is interesting is the guidance is less conservative than usual for their next quarter. It’s a timing issue, where it looks like the business that people thought would be in the September quarter is occurring in the December quarter," said Sterne Agee analyst Shaw Wu. Apple shares fell to $394.78 in after-hours trading, after closing at $422.24 on the Nasdaq.